November was a rough month for ardamis.com. What are JustHost’s thoughts on uptime? The term uptime refers to the amount of time that the website will be accessible. It is important to remember that unforeseen events do occur and that uptime guarantees are not written in stone. That being said, however, any established web hosting provider worthy of your business will strive to guarantee no less than 99.5% uptime. Here’s my Pingdom Monthly Report for 2012-11-01 to 2012-11-30 for ardamis.com. Boy, those 34 outages for a total of 6 hours and 45 minutes (0.94%) sure feels like a lot of downtime. That’s just a really pretty sad report. I have got to be better about catching my contract before it automatically renews. I’m looking at Lithium Hosting and a small orange as replacements, as they seem to be well-regarded by Ars Technica readers. This entry was posted in Nonsense, Web Site Dev, WordPress and tagged blogging, WordPress on 7 December 2012 by Oliver Baty. What is this Joomla exploit doing on my WordPress site? I recently ran the spider at www.xml-sitemaps.com against www.ardamis.com and it returned a list of URLs that included a few pages with some suspicious-looking parameters. This is the second time I’ve come across these URLs, so I decided to document what was going on. The first time, I just cleared the cache, spidered the site to preload the cache, and confirmed that the spider didn’t encounter the pages. And then I forgot all about it. But now I’m mad. But in the suspicious URL list, there are additional URLs for the pages directly off of the site’s root. This occurs only for the pagination of the main site’s pages. I did not find URLs containing the parameter ?option=com_google&controller= for any pages that exist under a category or tag, but that also use the /page/2/ convention. I compared the source code of the pages at the clean URLs vs that of the pages at the bad URLs and found that there was a difference in the pagination code generated by the WP-Paginate plugin. The good pages had normal-looking pagination links. The bad pages had the suspicious URLs, but were otherwise identical. Other than the URLs in the navigation, there was nothing alarming about the HTML on the bad pages. I downloaded the entire site and ran a malware scan against the files, which turned up nothing. I also did some full-text searching of the files for the usual base64 decode eval type stuff, but nothing was found. I searched through the tables in my database, but didn’t see any instances of com_google or proc or environ that I could connect to the suspicious URLs. The poster also provided a few lines of code for blocking these URLs in an .htaccess file. http://core.trac.wordpress.org/ticket/14556 – a bug ticket submitted to WordPress over a year earlier identifying a security hole if the function that generates the pagination isn’t wrapped in a url_esc function that sanitizes the URL. WP-Paginate’s author submits a comment to the thread, and the plugin does use url_esc. So, what would evidence of an old Joomla exploit be doing on my WordPress site? And what is happening within the WP-Paginate plugin to cause these parameters to appear? It seemed prudent to take a closer look at two of the plugins used on the site. Ardamis uses the WP-Paginate plugin. The business of generating the /page/2/, /page/3/ URLs is a native WordPress function, so it’s strange to see how those URLs become subject to some sort of injection by way of the WP-Paginate plugin. I tried passing a nonsense parameter in a URL (//ardamis.com/page/3/?foobar) and confirmed that the navigation links created by WP-Paginate contained that ?foobar parameter within each link. This happens on category pages, too. This behavior of adding any parameters passed in the URL to the links it is writing into the page, even if they are urlencoded, is certainly unsettling. The site also uses the WP Super Cache plugin. While this plugin seems to have been acting up lately, in that it’s not reliably preloading the cache, I can’t make a connection between it and the problem. I also downloaded the cache folder and didn’t see cached copies of these URLs. I turned off caching in WP Super Cache but left the plugin activated, cleared the cache, and then sent the spider against the site again. This time, the URL list didn’t contain any of the bad URLs. Otherwise, the lists were identical. I re-enabled the plugin, attempted to preload the cache (it got through about 70 pages and then stopped), and then ran a few spiders against the site to finish up the preloading. I generated another URL list and the bad URLs didn’t appear in it, either. The unwanted behavior of the WP-Paginate plugin can be corrected by changing a few lines of code to strip off the GET parameters from the URL. The lines to be changed all reference the function get_pagenum_link. I’m wrapping that function in the string tokenizing function strtok to strip the question mark and everything that follows. The relevant snippets of the plugin are below. Once these changes are made, WP-Paginate will no longer insert any passed GET parameters into the links it’s writing into that page. The change to the WP-Paginate plugin is what we tend to call a bandaid – it doesn’t fix the problem, it just suppresses the symptom. I’ve found that once the site picks up the bad URLs, they can be temporarily cleaned by clearing the cache and then using a spider to recreate it. The only thing left to do is determine where they are coming from in the first place. Let’s pause to review the facts. So how is the spider finding pages with these bad URLs? How are they first getting added to a page on the site? It would seem likely that they are originating only on the home page, and the absence of the parameters on other pages that use pagination seems to support that theory. Well, the day is over. I’ve added my updated WP-Paginate plugin to the site, so hopefully Ardamis has seen the last of the problem, but I’m deeply unsatisfied that I haven’t been able to get to the root cause. I’ve scoured the site and the database, and I can’t find any evidence of the URLs anywhere. If the bad URLs come back again, I’ll not be so quick to clean up the damage, and will instead try to preserve it long enough to make a determination as to their origin. Update 07 April 2012: It’s happened again. When I spider the site, two pages have the com_google URL. These page have the code appended to the end of the URL created by the WordPress function cancel_comment_reply_link(). This function generates the anchor link in the comments area with an ID of cancel-comment-reply-link. This time, though, I see the hijacked URL used in the link even when I visit the clean URL of the page. This code is somehow getting onto the site in such a way that it only shows up in the WP Super Cache’d pages. Clearing the cache and revisiting the page returns a clean page. 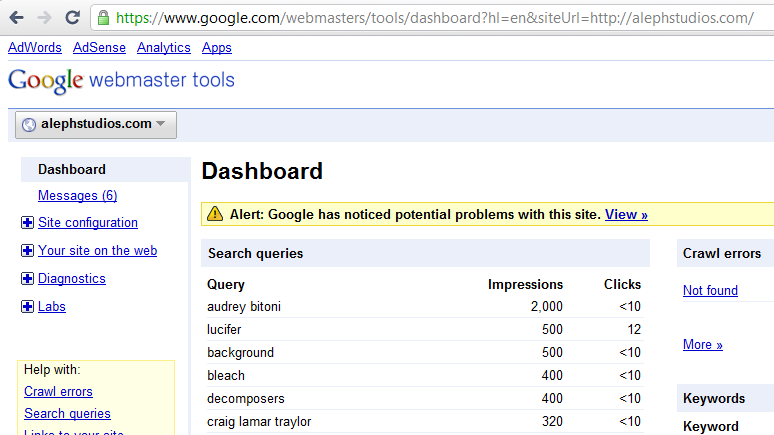 My suspicion is that someone is visiting my pages with the com_google code as part of the URL. WordPress puts the code into a self-referencing link in the comment area. WP Super Cache then updates the cache with this page. I don’t think WordPress can help but work this way with nested comments, but WP Super Cache should know better than to create a cached page from anything but the content from the server. In the end, because I wasn’t using nested comments to begin with, I chose to remove the block of code that was inserting the link from my theme’s comments.php file. I expect that this will be the last time I find this type of exploit on ardamis.com, as I don’t think there is any other mechanism that will echo out on the page the contents of a parameter passed in the URL. This entry was posted in Nonsense, Web Site Dev, WordPress and tagged database, php, plugin, programming, security, troubleshooting, WordPress on 27 February 2012 by Oliver Baty. Google’s Panda update and Google+ has motivated me to start using more cutting-edge technology at ardamis.com, starting with a new theme that makes better use of HTML5 and microformats. I rather like the look of the current theme, but one of the metrics that Panda is supposedly weighting is bounce rate. Google Analytics indicates that the vast majority of my visitors arrive via organic search on Google while looking for answers to a particular problem. Whether or not they find their answer at ardamis.com, they tend not to click to other pages on the site. This isn’t bad, it’s just the way it works. I happen to be the same sort of user – generally looking for specific information and not casually surfing around a web site. In the prior WordPress theme, I moved my navigation from the traditional location of along side the article to the bottom of the page, below the article. This cleaned up the layout tremendously and focused all the attention on the article, but it also made it even more likely that a visitor would bounce. For the 2012 redesign, I moved the navigation back to the side and really concentrated on providing more obvious links to the About, Portfolio, Colophon and Contact pages. I’ve been a fan of the HTML5 Boilerplate template for starting off hand-coded sites, and I’ve once again cherry-picked elements from it to use as a foundation. If you’re interested in a running start, you may try out the very nice Boilerplate WordPress theme by Aaron T. Grogg. The latest version of the theme also faithfully follows the sometimes idiosyncratic whims of Google Webmaster Tools’ Rich Text Snippet Testing Tool. Look, no warnings. This entry was posted in Google, Web Site Dev, WordPress and tagged blogging, html5, templates, themes, WordPress, xhtml on 7 February 2012 by Oliver Baty. Just a few weeks behind schedule, but a long time in the works, I’ve finally pushed the new WordPress theme for Ardamis live. Basic and elegant (I’m trying to establish a trend here), the theme also should outperform its predecessors in both page load times and SEO-potential. The index and archive pages should appear more consistent, and all pages should provide more complete structured data markup (schema.org as well as microformats.org). The comment form has been outfitted with an improved approach to reducing comment spam. The new theme is pretty light on the graphics, due to increased browser support for and subsequently greater use of CSS3 goodness for box shadows and gradients. I’ve reduced the number of image files to two: a background and a sprites file. Only half-implemented in the previous theme, the new look, “Joy”, makes much better use of structured data markup, or microdata. Google is absolutely looking for ways to display your pages’ semantic markup in its results, so you may as well get on board. In sum, I think Ardamis should be leaner, faster, and smarter (and maybe prettier) in 2012 than ever before. Update 2015-01-02: About a month ago, in early December, 2014, Google announced that it was working on a new anti-spam API that is intended to replace the traditional CAPTCHA challenge as a method for humans to prove that they are not robots. This is very good news. I haven’t yet dug into the Akismet code to discover what it’s doing with the timestamp, but I’d be pleased if Akismet is attempting to differentiate humans from bots based on behavior. Update 2015-01-10: To test the effectiveness of the current version of Akismet, I disabled the anti-spam plugin described in this post on 1/2/2015 and re-enabled it on 1/10/2015. In the span of 8 days, Akismet identified 1,153 spam comments and missed 15 more. These latest numbers continue to support my position that Akismet is not enough to stop spam comments. In the endless battle against WordPress comment spam, I’ve developed and then refined a few different methods for preventing spam from getting to the database to begin with. My philosophy has always been that a human visitor and a spam bot behave differently (after all, the bots we’re dealing with are not Nexus-6 model androids here), and an effective spam-prevention method should be able to recognize the differences. I also have a dislike for CAPTCHA methods that require a human visitor to prove, via an intentionally difficult test, that they aren’t a bot. The ideal method, I feel, would be invisible to a human visitor, but still accurately identify comments submitted by bots. The most successful and simple method I found was a server-side system for reducing comment spam by using a handshake method involving timestamps on hidden form fields that I implemented in 2007. The general idea was that a bot would submit a comment more quickly than a human visitor, so if the comment was submitted too soon after the post page was loaded, the comment was rejected. A human caught in this trap would be able to click the Back button on the browser, wait a few seconds, and resubmit. This proved to be very effective on ardamis.com, cutting the number of spam comments intercepted by Akismet per day to nearly zero. For a long time, the only problem was that it required modifying a core WordPress file: wp-comments-post.php. Each time WordPress was updated, the core file was replaced. If I didn’t then go back and make my modifications again, I would lose the spam protection until I made the changes. As it became easier to update WordPress (via a single click in the admin panel) and I updated it more frequently, editing the core file became more of a nuisance. When Google began weighting page load times as part of its ranking algorithm, I implemented the WP Super Cache caching plugin on ardamis.com and configured it to use .htaccess and mod_rewrite to serve cache files. Page load times certainly decreased, but the amount of spam detected by Akismet increased. After a while, I realized that this was because the spam bots were submitting comments from static, cached pages, and the timestamps on those pages, which had been generated server-side with PHP, were already minutes old when the page was requested. The form processing script, which normally rejects comments that are submitted too quickly to be written by a human visitor, happily accepted the timestamps. Even worse, a second function of my anti-spam method also rejected comments that were submitted 10 minutes or more after the page was loaded. Of course, most of the visitors were being served cached pages that were already more than 10 minutes old, so even legitimate comments were being rejected. Using PHP to generate my timestamps obviously was not going to work if I wanted to keep serving cached pages. It took me two tries to get it right, but I’m going to discuss the less successful method first to point out its flaws. Here’s how the original system flowed. Generate a first JS timestamp when the page is loaded. Generate a second JS timestamp when the form is submitted. Before the form contents are sent to the server, compare the two timestamps, and if enough time has passed, write a pre-determined passcode to a hidden INPUT element, then submit the form. After the form contents are sent to the server, use server-side logic to verify that the passcode is present and valid. Because the timestamps were only compared on the client-side, it also failed to adhere to one of the basic tenants of form validation – that the input must be checked on both the client-side and the server-side. Generate a first JS timestamp when the page is loaded and write it to a hidden form field. Generate a second JS timestamp when the form is submitted and write it to a hidden form field. Before the form contents are sent to the server, compare the two timestamps, and if enough time has passed, submit the form (client-side validation). On the form processing page, use server-side logic to compare the timestamps a second time (server-side validation). For a long time, far longer than I care to admit, I stubbornly continued to modify the core file wp-comments-post.php to provide the server-side processing. But creating the timestamps and parsing them with a plug-in turned out to be a simple matter of two functions, and in June of 2013 I finally got around to doing it the right way. The plugin, in all its simplicity, is only 100 lines. Just copy this code into a text editor, save it as a .php file (the name isn’t important) and upload it to the /wp-content/plugins directory and activate it. Feel free to edit it however you like to suit your needs. Description: This plugin measures the amount of time between when the post page loads and the comment is submitted, then rejects any comment that was submitted faster than a human probably would or could. That’s it. Not so bad, right? The screen-shot at the beginning of the post shows the number of spam comments submitted to ardamis.com and detected by Akismet each day from the end of January, 2012, to the beginning of March, 2012. The dramatic drop-off around Jan 20 was when I implemented the method described in this post. The flare-up around Feb 20 was when I updated WordPress and forgot to replace the modified core file for about a week, illustrating one of the hazards of changing core files. If you would rather not add any hidden form fields to the comment form, you could consider appending the two timestamps to the end of the comment_post_ID field. Because its contents are cast as an integer in wp-comments-post.php when value of the $comment_post_ID variable is set, WordPress won’t be bothered by the extra data at the end of the field, so long as the post ID comes first and is followed by a space. You could then just explode the contents of the comment_post_ID field on the space character, then compare the last two elements of the array. If you don’t object to meddling with a core file in order to obtain a little extra protection, you can rename the wp-comments-post.php file and change the path in the comment form’s action attribute. I’ve posted logs showing that some bots just try to post spam directly to the wp-comments-post.php file, so renaming that file is an easy way to cut down on spam. Just remember to come back and delete the wp-comments-post.php file each time you update WordPress.